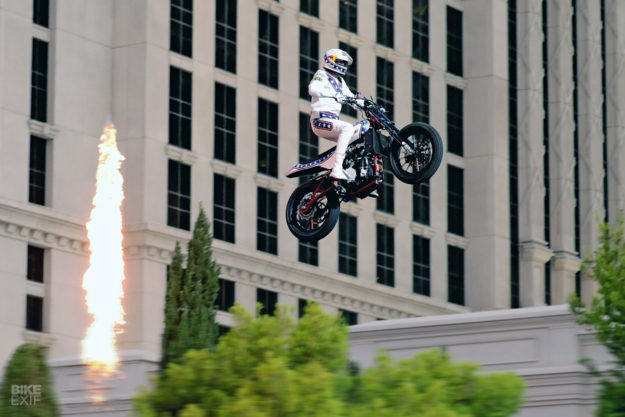 It was the biggest moto stunt of the 21st century. 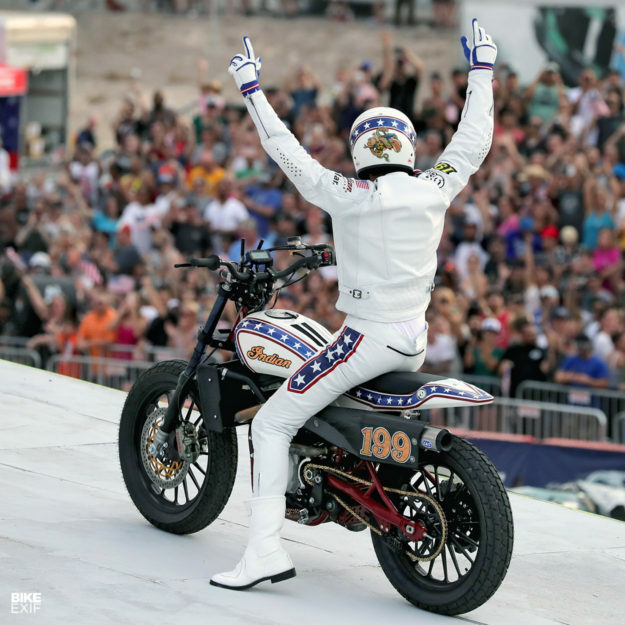 In a marketing masterstroke for Indian Motorcycle, Travis Pastrana reprised three of Evel Knievel’s most iconic jumps in one day—including the Caesar’s Palace fountain jump that put Knievel in hospital. 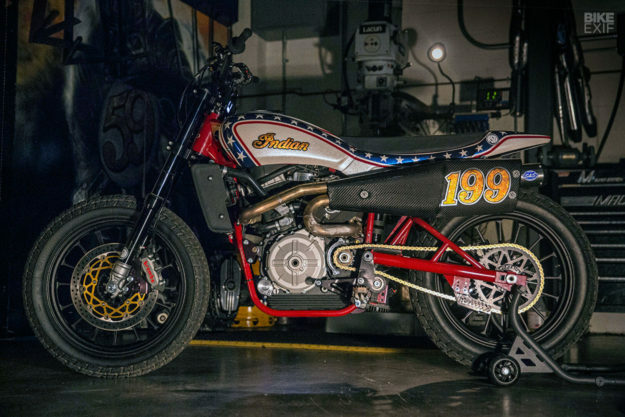 Pastrana picked the Indian Scout FTR750 as his weapon of choice. Why? 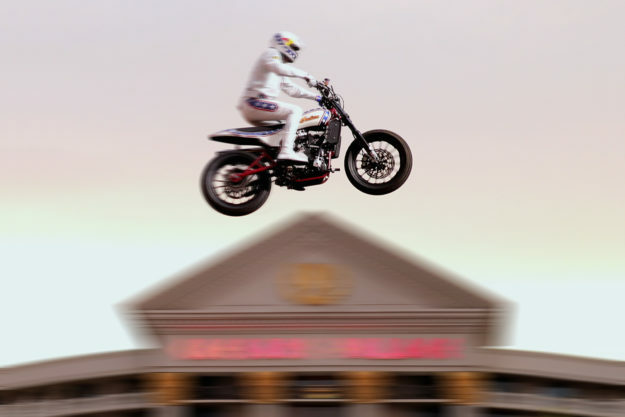 Because the stunt was an homage to the days before purpose-built FMX machines became a thing. The FTR750 is cleaning up in the AMA Flat Track series right now. But there’s a huge difference between pinning it around a dirt oval and sailing it 149 feet through the air, aiming for a ramp on the other side. 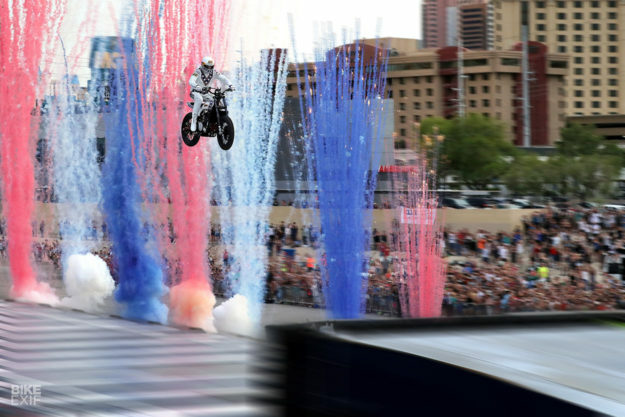 As you’d expect, significant suspension upgrades were called for, so that the FTR would cope with the rigors of stunt jumping. Get it wrong, and the consequences could be…catastrophic. Specialist Jimmy Wood stepped in, revalving the stock Öhlins forks to increase stiffness, and building a custom Race Tech GS3 rear shock. Travel now measures 115mm up front, and 118mm out back; “It’s the stiffest set up we’ve ever put on a bike,” RSD tell us. They also gusseted the swing arm, for extra peace of mind. And then installed stronger triple trees, which were originally developed for TT racing by Ricky Howerton and S&S Cycle. The FTR750 still rolls on flat track rubber, in the form of 19” Dunlop DT3s. But the wheels have been swapped for a set of ‘Traction’ race items from RSD’s own catalog. Curious about what sort of pressures you’d run for jumping over things? It’s 28 psi at the front, and 32 psi at the rear—considerably lower than the recommended pressures on the road-going Scout. Other components include ProTaper grips, and a TrailTech Stealth Striker speedo. The foot controls are a mix of RSD mid-mounts, with ProTaper platform footpegs. The Las Vegas heat was a concern too, so the RSD crew spent time running the water-cooled V-twin as hot as they could to predict every eventuality. 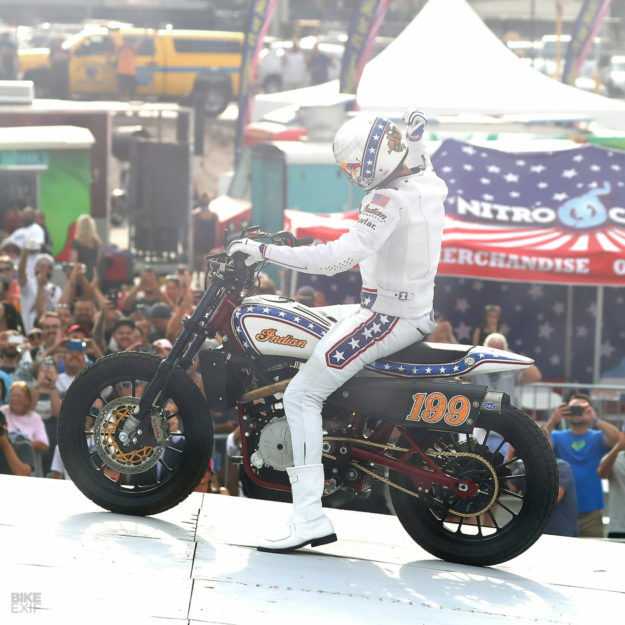 They filled the Indian up with an Evans Powersports ‘waterless’ coolant, a popular choice with race teams, and added a TrailTech electric cooling fan. In the end, the skies were overcast at the time of the jump, and the temperature in the low 70s. Equal consideration went into the gearing. RSD fitted Superlite quick-change race sprockets, but shortened the gearing so that Pastrana could get up to 2nd and 3rd for the jumps. That way, they could eliminate any possibility of a false neutral between 1st and 2nd at a critical time. Other upgrades include an S&S Cycle front brake kit with Spiegler brake lines. 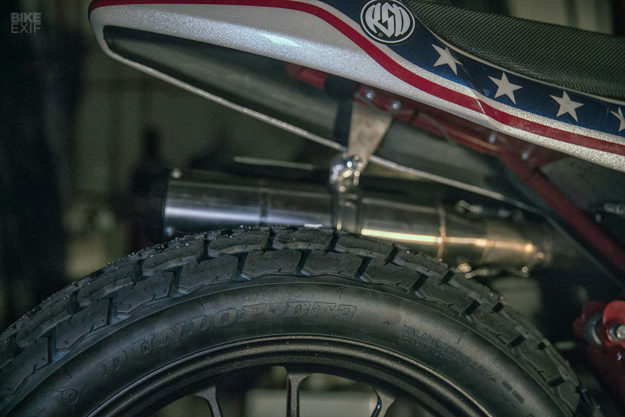 Look closely, and you’ll notice there’s just one silencer poking out behind the FTR750’s beefy exhaust heat shield: the team switched the stock system out for an S&S Cycle two-into-one TT system. We rarely profile bikes with stock bodywork. But the FTR750 looks so good out the box—and is so period correct—that there was no need to swap out the tank and tail. The only bodywork change was subtle—but very necessary. Seat specialists Saddlemen built a custom, MX-style gripper seat to RSD’s spec. 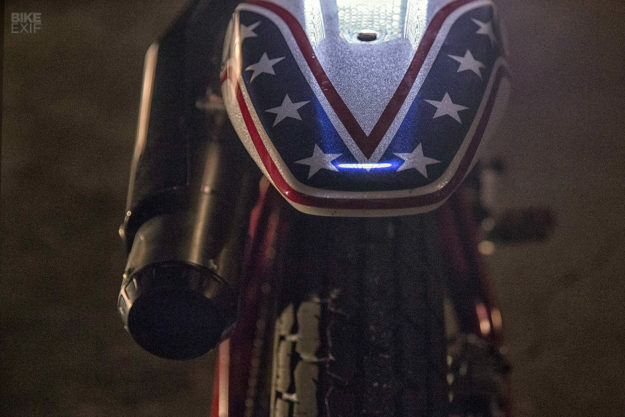 With that sorted, Airtrix laid down probably the most important mod of all—an Evel Knievel replica livery. 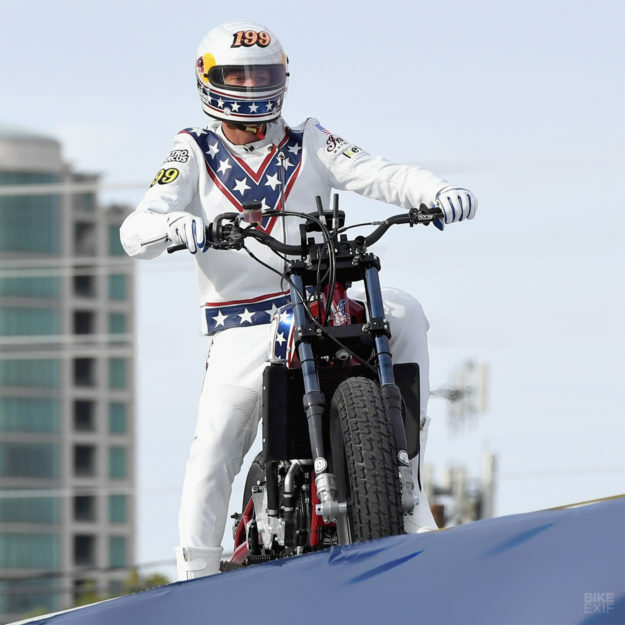 Pastrana donned his matching leather jumpsuit, wheeled the FTR750 out in front of a 25,000-strong audience, and nailed all three jumps on the day (breaking Knievel’s car and bus records in the process). 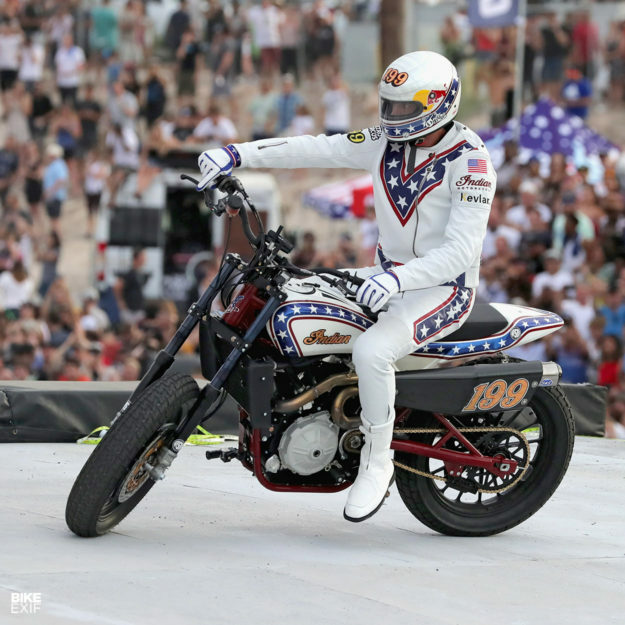 Neither Pastrana, nor the FTR750, broke. We’d call that a win.